Among Pixar’s extensive filmography, the Cars series is something of an anomaly. While the first one wasn’t exactly a critical darling – or at least not as much as some of Pixar’s other films – it still gained an audience of mostly young children, and toy sales went through the roof. That is the only reason I can give for Cars 2 existing, which is not only the worst Pixar film to date but is such a hated movie within even the studio’s biggest fans that nobody wants to revisit it after being subjected to it for the first time. Yet, for all their criticism, they continue to do well amongst its target audience, albeit at the expense of its slightly larger adult fan base (by the way, the Planes spin-off movies don’t count in this argument, as they were produced in-house by Disney and not Pixar). But somehow I doubt that even the youngest audience members were crying out for a third instalment, yet here we are with Cars 3, which is infinitely better than Cars 2… and that’s about it. Seriously, there’s not a whole lot to say about this one, aside from the fact that it’s pretty much the series on cruise control, but I’ll try to fill this review as best as I can. 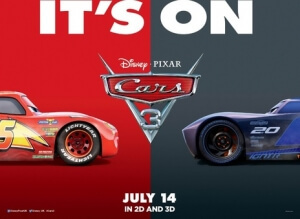 This one kicks off with Lightning McQueen (once again voiced by Owen Wilson) facing a rather difficult racing season, particularly because he’s beginning to be left in the dust by a whole new generation of racers, including the brash and arrogant Jackson Storm (Armie Hammer). After a mid-race accident takes him out of the circuit altogether, he is faced with the prospect of having to retire altogether, and focus his attention on a merchandising deal with his new sponsor, rich business car Sterling (Nathan Fillion). However, McQueen is determined to prove he’s still got it in him, and sets out to rediscover his roots with his new trainer Cruz Ramirez (Cristela Alonzo), in a bid to out-manoeuvre the new generation. The thing about Cars 3 is that while it’s significantly less obnoxious and enraging than its immediate predecessor, you’re still left a little empty by the experience. What you’re watching isn’t necessarily awful, but it’s not great either, so your initial reaction to it may be something along the lines of “meh”, and isn’t expected to be better or worse than that. At least with the first Cars film there was a slight intrigue as to what was going to happen, even if it was ripping off the entire storyline from Doc Hollywood, and there was a little bit of charm to it that would justify at least one viewing. Here, while there is at least an effort to retain some of the first film’s charm, which is more than I can say for Cars 2, it still doesn’t feel as warranted this time, because a lot of it consists of numerous sports movie clichés that have been tried and tested countless times over, and no matter what situation you place them in – in this case, a world of sentient automobiles – they’re still recognisable even to the most basic of movie goers. That’s not to say that there’s nothing positive to say about the film; for instance, as has been the case with all these Cars movies, the animation is gorgeous. The animators at Pixar have pretty much nailed the photo-realistic backdrops with cartoonish lead characters method (see also The Good Dinosaur), and with this film there is underlying beauty to the way things in the background from the ocean to the wilderness is rendered. Even the character designs, as cartoonish as they are, have unbelievable textures to them; never before has a talking car voiced by Owen Wilson looked so legitimately shiny and polished up on-screen. By the way, Larry the Cable Guy’s Mater is barely in this movie, which should come as a relief to everyone who couldn’t stand his leading-man status in the previous film; in fact, you can watch both Cars 1 and 3 without even consider seeing Cars 2, as nothing is developed in that film or even mentioned in this one, so this is basically the real Cars 2 instead of the actual one. Anything that nullifies the existence of Cars 2 is okay in my book, and that’s ultimately what my opinion on this film comes down to: it’s “okay”. For the positives I mentioned there are a similar number of negatives, from its predictable plot to its bland humour, but none of them are overwhelming enough to say that this is an entirely bad movie. Any non-fans of these films thus far will absolutely not be swayed by this one, as it offers more of the same type of quality as before (although, again, nothing quite as obnoxiously awful as Cars 2), and while young children will probably get a good kick out of it there’s not a whole lot else to really entice adults into loving it. They’ll probably be better off waiting for Pixar’s next entry later this year, the colourful-looking Coco which looks a lot more emotionally-investing than Cars 3 is, and will probably leave you with far more of an impression than just simply a mere “meh”. Cars 3 is a significant improvement over the dreadful Cars 2, but the emotional investment just isn’t there as it’s replaced by a clichéd story and a bland sense of humour that only the youngest of audience members will laugh at, something that not even the stellar animation and lack of Larry the Cable Guy’s Mater will salvage for a more grown-up audience. It’s not godawful, but it’s definitely in cruise control.